© Brexit Facts4EU.Org 2019 - Larger version of this chart is below. Given the outrageous official statement by unelected EU Council President Donald Tusk yesterday, readers may like to review a summary of some facts relevant to Poland and its relationship with the EU and particularly with the UK. According to the ONS, 890,000 Poles live in the UK. This is widely assumed to be a large underestimate, due to the lack of proper monitoring conducted by the authorities. For years the provision of new N.I. numbers to EU nationals has far outstripped the supposed number of migrants entering the country from the EU, as we have reported many times. Last year in the 11 months to November 2018, Donald Tusk’s home country of Poland sold €12.7 billion of goods to the UK. In return they bought just €5.0 billion of British goods, giving them a massive trade surplus of €7.7 billion in just 11 months. Their exports to the UK went up by a healthy 5.8% compared to the same period in 2017. The UK was the third largest market for Poland last year. By contrast, Poland sold only €5.6 billion of goods to the USA in the same period, with a negative trade balance of -€0.3 billion. For Poland’s exports, the UK’s market is worth more than double that of the USA. Poland is the largest net beneficiary of the EU budget by a long way. For the last year for which figures are available, Poland received an amount exceeding the UK’s net contribution. In 2017, Poland received a net subsidy more than twice the size of any other EU member state. 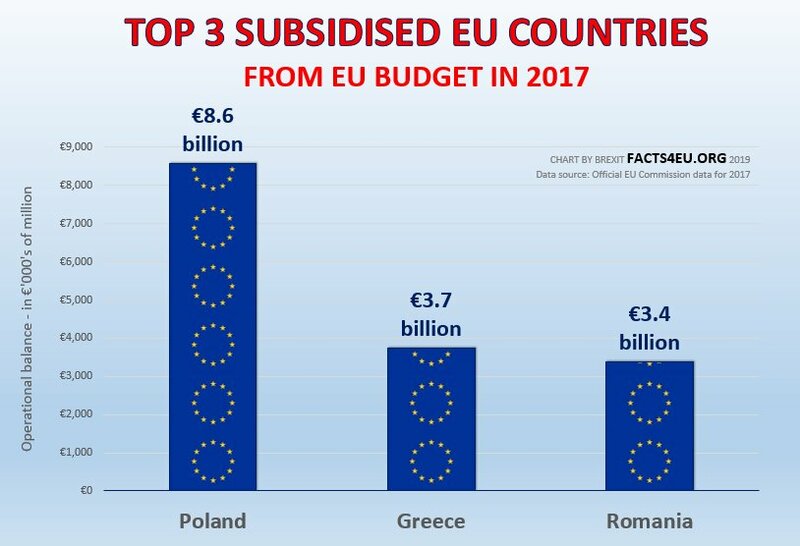 With the UK being one of the few net contributors to the EU budget over the past 45 years, the British taxpayer has been subsidising Poland ever since that country joined the EU. Please note: The above does not present the full picture, as the UK also pays heavily into the EU’s ‘off-budget’ funds – something we have reported on many times. If we were Polish, like Mr Tusk, we would probably not be inclined to antagonise the people of the UK. Given that he has done so, we welcome his apparent support for our #GoWTO campaign. We anticipate that his comments will persuade even more British people that the sooner we leave this sclerotic and anti-democratic organisation, the better. For information, the most frequently imported Polish goods into the UK are: food and drinks; chemical products including pharmaceuticals, cosmetics and cleaning agents; furniture, interior fittings, doors and windows; clothing and household appliances and consumer electronics. A couple of years ago I watched a clip on German TV, explaining how Poland is having to bring in men from Ukraine to do the work that the Poles who had come to the UK used to do. Has anyone collected data regarding foreign workers money earned in the UK being sent / taken out of the UK , I am sure it is billions which is bad for our economy by fact the money is not put. Ack into our economy via spending here.